A Bear Market Strategy selects safe harbor investments during a market crash. Wall Street uses the terms risk-on / risk-off to describe a move to riskier investments with potentially higher yields during bull markets and a move to safer investments with typically lower yields during bear markets. When a market direction indicator (such as StormGuard or the Death Cross) signals that conditions have become bearish, a Bear Market Strategy automatically takes charge and selects from a list of trusted safe harbor investments, such as cash, money market funds, bond funds, gold bullion, or U.S. Treasuries. Numerous market direction and sentiment indicators have been developed over the years to help determine when to flee to safety. Although the basis for many of them sound promising, many are only poorly correlated with future performance, and none of them come close to the performance provided by StormGuard-Armor. (Some of the better ones are compared HERE). 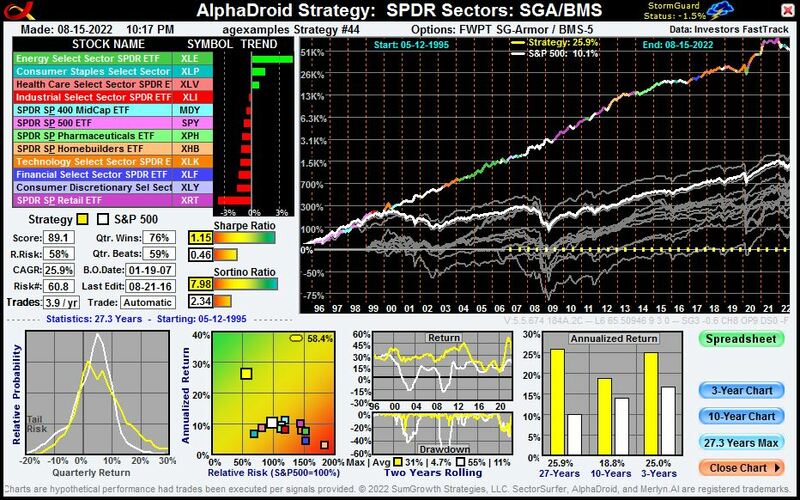 The remarkable difference between the yellow equity curves in the three Strategy charts below illustrate the combined importance of StormGuard-Armor and Bear Market Strategies. The yellow equity curve, compound annual growth rate (CAGR) and Sharpe Ratio (risk-adjusted return) in each chart above illustrate why Bear Market Strategies matter. 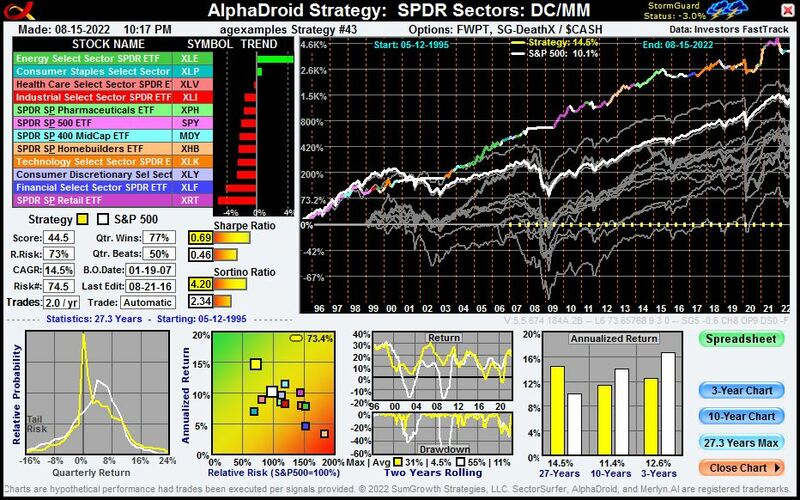 All three investment Strategies rely on the True Sector Rotation algorithm to determine which one of the eight candidate SPDR sector ETFs to own each month during bull markets. However, the left-most Strategy has no market crash protection, the center Strategy additionally utilizes StormGuard-Armor to determine when to exit the market to the safety of cash, and the right-most Strategy further utilizes StormGuard-Armor in combination with Bear Market Strategy BMS-4 to select the best trending ETF during bear markets from among safe harbor candidates UST, TLT, BND, MBG, MUB, CORP, SH, and GLD. 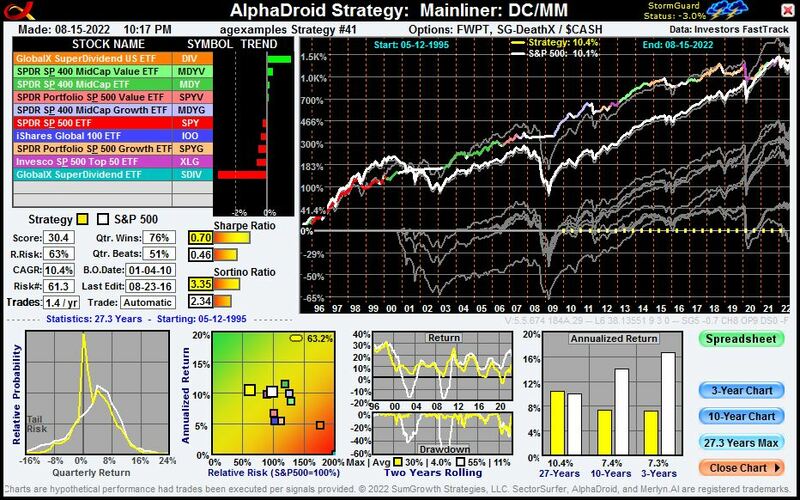 In order to reasonably model the performance of a BMS (Bear Market Strategy), its candidate investments must have performance data that spans at least one major market crash. Although most ETFs that might provide safe harbor during a bear market were originated only recently, most are based on indexes having much longer histories that can be used to artificially extend the ETF's data history for purposes of improved strategy modeling. 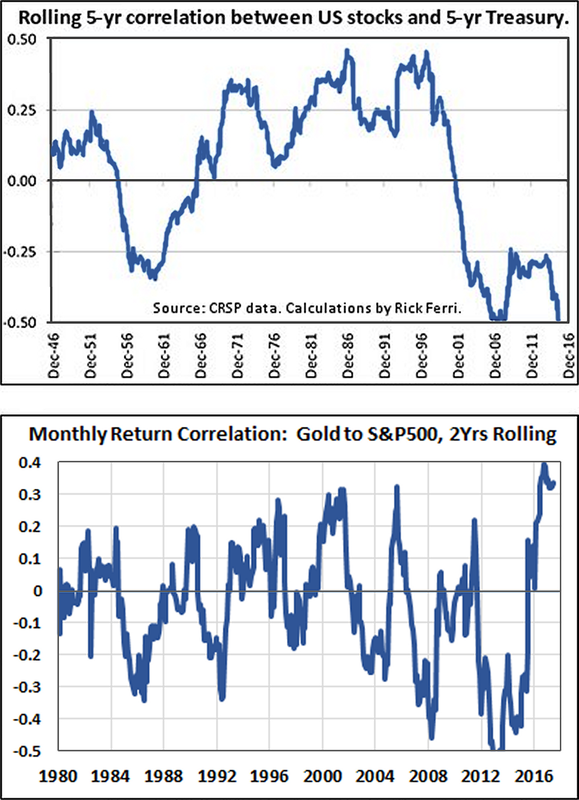 The table below contains excellent candidates from these asset classes: long-term treasuries, bonds, inverse markets, gold bullion, and a hybrid mix of the inverse S&P500 index with gold bullion. Additional documentation and a list of numerous other extended ticker symbols can be found HERE. • Note 1: DSD column in the above table refers to the Decision Shift Days advanced option. It is presumed that (a) BMS-5 and BMS-6 will be primarily associated with some of the narrower sector ETFs and 2x ETFs that generally perform better with a DSD setting of -1; and (b) that BMS-7 will be primarily associated with 3x ETFs that often perform better with a DSD setting of -2. 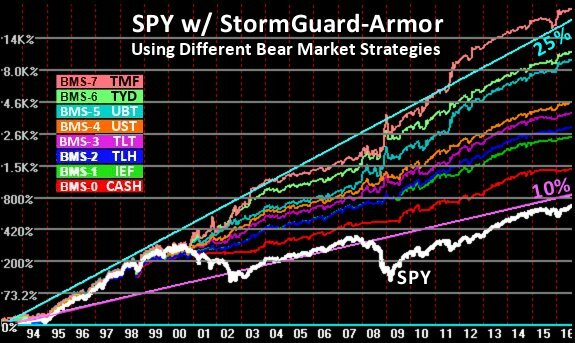 Contrast: The comparative benefit and character of the seven ETF Bear Market Strategies is illustrated in the chart (right) for the simple strategy of owning SPY unless StormGuard-Armor indicates moving to safety with a Bear Market Strategy. Note the significant differences in total return, return uniformity, and general volatility. Guidance: Selecting a Bear Market Strategy is primarily a matter of judgment involving investment risk tolerance. Since the character of the main Strategy's candidate funds is already a statement of investment risk tolerance, using a Bear Market Strategy of similar character is appropriate. For example (a) a broad asset class Strategy typical of a 401k plan would be best matched to BMS-2 or BMS-3; (b) a sector rotation strategy would be best matched to BMS-4 or BMS-5; and (c) an aggressive 2x or 3x leveraged fund strategy would be best matched with BMS-6 or BMS-7. The best way to create a custom Bear Market Strategy is to start by importing and modifying an existing one. Examples include (1) BMS-Vanguard may be more suitable if the ETF duo SHGD- were deleted; (2) BMS-Fidelity may perform better if it were more aggressive and included UST-; (3) A BMS could be modified to incorporate UGL- or GDX- directly; or (4) ETFs not considered above may be found to further improve performance while still reasonably addressing hindsight selection bias. In order to use your custom BMS in another Strategy, you must identify it using the special ticker symbol format of ADnnn, meaning AlphaDroid Strategy #nnn (where nnn has no leading zero). 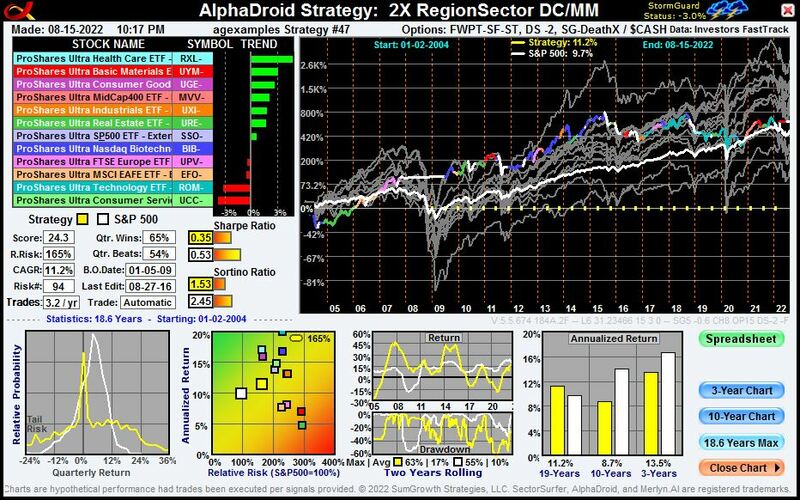 For example, if your BMS is Strategy #24, then use AD24 as the special ticker symbol when specifying it in the Advanced StormGuard Options Bear Symbol field of any Strategy for which AD24 is to act as the Bear Market Strategy. StormGuard options are located on the Strategy Information popup window, which is accessed by clicking the icon next to the Strategy's name on the Strategies Management page. Click the button to expose them and make your selection from among the StormGuard Options shown. In addition to the six StormGuard methods for detecting the onset of a bear market, the Bear Symbol provides a method for determining which investment should be held during bear markets by specifying its ticker symbol. Although $CASH (a generic symbol used to mean "your favorite money market fund") is the default symbol, you may use any other ticker symbol of your choice, including those for (1) ETFs and mutual funds; (2) extended history symbols; (3) ready-made Bear Market Strategies (listed above); or (4) the special ticker symbol for referencing one of your own Strategies using the format of ADnnn, for AlphaDroid Strategy #nnn (where nnn has no leading zero). 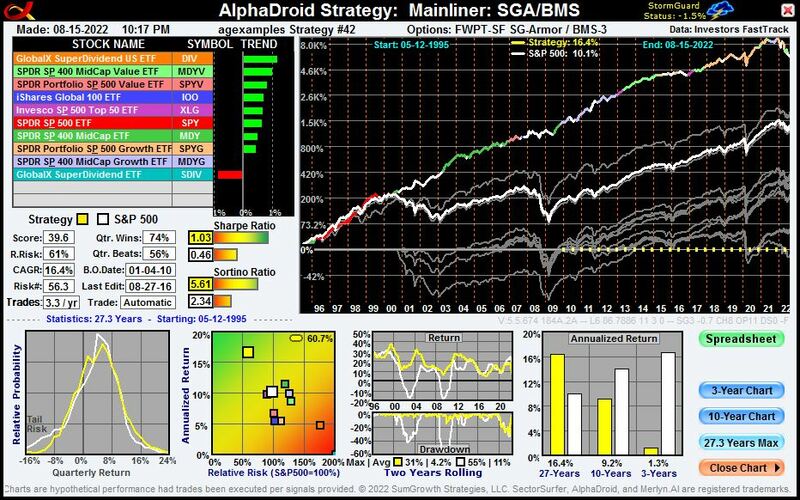 Below are a set of Strategy pairs showing the stark contrast between using (1) the well-known and respected Death Cross an algorithm to determine when to move to the safety of a money market fund; versus (2) the better performing StormGuard-Armor algorithm, which determines when to switch to a Bear Market Strategy. In the charts below, the Strategy equity curve is multi-colored to show which of the candidate funds was owned at any particular time. The equity curve is white when the Death Cross or StormGuard algorithms have triggered and have commandeered the investment decision. StormGuard, Polymorphic Momentum and Temporal Portfolio Theory are registered trademarks of SumGrowth Strategies, LLC. All materials copyrighted 2016 SumGrowth Strategies, LLC. SumGrowth Strategies' automated investment analysis tool provides no financial investment advice specific to anyone's life situation. SumGrowth Strategies is not a registered investment advisor.